Considering we're hot off an election, it may be worth injecting a dose of political responsibility into this year's Thanksgiving celebration. I have compiled some ways to support Standing Rock this Thanksgiving if you're unable to physically make your way to North Dakota, but would prefer to replace your Black Friday shopping habit with a contribution to the #NoDAPL protesters. Personally, I believe there is a deep hypocrisy in tending to our travel and meal preparations this Thanksgiving while Native American leaders and protesters are getting sprayed with tear gas for defending the sanctity of water on a reservation. Although it would be pretty in keeping with the trends of American history. As the weather gets colder, the stakes of physical safety have only increased for the people protesting the Dakota Access oil pipeline, which would deliver approximately half a million barrels of oil between North Dakota and Illinois daily. The members of Standing Rock Sioux Nation and protesters have camped out where the pipeline is slated to cross the Missouri River since April. However, despite their tenacity, conditions intensified over the weekend, as the Morton County Police sprayed 400 protesters with tear gas on Sunday, amidst freezing temperatures. As a result, at least 17 protesters were hospitalized, which included a handful treated for hypothermia, according to demonstration organizers who spoke to the New York Daily News. As we gather this Thanksgiving either with friends or family, or possibly cuddle up in bed alone, there are a few ways we can lend support and solidarity to Standing Rock, even from afar. One of the most practical ways to lend your support to the Standing Rock Sioux Nation and their fellow protesters is by donating to the camp's official GoFundMe account. All of the donations go directly towards providing water, propane, food, and blankets for the camp. You can donate and leave a message here. The community of Standing Rock Sioux have filed a lawsuit and temporary restraining order against the U.S. Army Corps of Engineers for allowing the project to move forward without considering the environmental impact on the community. All of the donations to the Sacred Stone legal defense fund go toward supporting the lawsuit as well as supporting protesters arrest for taking direct action. You can donate here. If you're on a tighter budget or have an influx of useful camping and survival supplies, donating necessities from the Sacred Stone Camp supply list is a great way to help out. The supply list here is frequently updated and details supply needs ranging from walkie-talkies to cigarettes to battery packs. There's something for everyone to donate. Luckily for those of us not overladen with cash or supplies, there are many ways to express support that don't require an expendable income (although donations are particularly crucial right now). 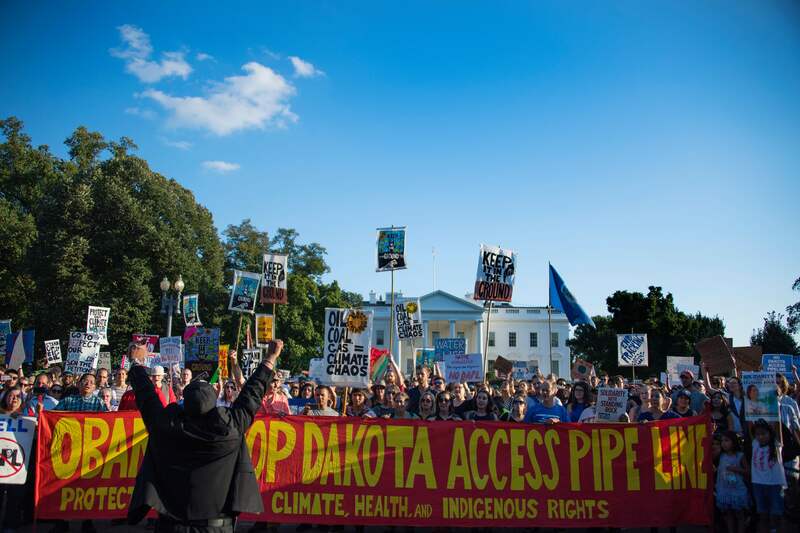 One act of solidarity everyone can do is call the White House at 202-456-1111 or 202)456-1414, and request that President Obama revoke the Army Corps of Engineers' permit for the Dakota Access Pipeline. You can directly call the governor of North Dakota, Jack Dalrymple, at 701-328-2200 and let him know that you disagree with his handling of the #NoDAPL protests. These are obviously just a handful of ways to express solidarity from faraway, and yet, making a few phone calls and some donations this Thanksgiving is a far better alternative to silence or complicity.